A shade shelter provides a semi-permanent or permanent, structured shade solution. Perth is one of the many cities in the world affected by the depleting ozone layer. We are exposed to intense heat and damaging sun emissions, which can make spending time outdoors unbearable. With a shade shelter from Shade Experience, you can protect yourself, your family, your guests and vehicles. 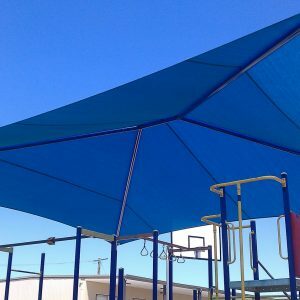 This high-quality covering is commonly used for care centres, council parks, school outdoor play areas or commercial car parks due to its standard dimensions and large shade area. A shade shelter comes in square or rectangular form, similar to the shape of a gazebo. Like all our shade solutions, we use the highest possible quality material and hardware to ensure a long lasting, maintenance-free cover. We install our products to Australian Standard specifications and all shelters come with our stamp of quality, approval and guarantee. Our skilled staff have widespread knowledge in the industry; whether you want to know about the fabric, how a shade offers protection, UV coatings, hardware or even ground foundation, we have the capability to assist you. The perfect example of a large outdoor shade solution is a park shelter. Provide an even amount of shade over a large or small park area. The shade shelter has become increasingly popular due to its sleek design, durability and affordability. What makes it a versatile option for residential and commercial industries is that the shape suits both modern and traditional surroundings. You can also customise your park shelter by changing the colour that best suits your requirements. For example, if young children mostly use the park, you can install a brightly coloured shade that will add a unique, fun element to the park. What makes the outdoor shelter the perfect solution for providing shade is that the woven fabric used to create the covering, is porous. This allows built-up hot air to escape, creating a cooler, shaded area underneath. This makes it perfect for car parks, play areas and schools. Most outdoor umbrellas just provide shade with no solution to create a cooler area. With a shade shelter, you can enjoy spending a comfortable time outdoors, shaded from the heat. 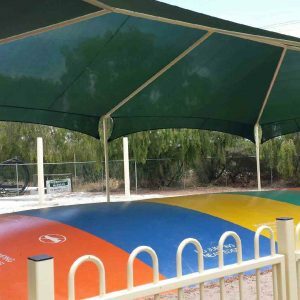 A shade shelter is generally larger than a shade sail, which means that the area you wish to install it in has to be free of any structural hindrances such as electricity lines, water piping and telephone poles. 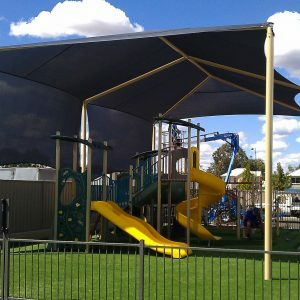 Your shelter – regardless of the application you choose to use it for – can be manufactured to suit your unique specifications, so contact the experts at Shade Experience and start designing your customised shade shelter. Contact Shade Experience for a variety of shade sail options.